Mark Feffer is a writer who focuses on HR, technology, and data analytics from his base near Philadelphia. A casual drive around Scranton, Pennsylvania, reveals one of the most significant challenges that local distribution centers face in trying to attract employees: an extremely competitive market. One billboard announces lofty starting salaries at Amazon.com’s newest local warehouse. Less than a mile down the road, another billboard touts jobs at the new Chewy.com distribution center in town. And in a nearby shopping center parking lot, a local staffing firm has stuck flyers under the windshield wipers of parked cars, offering $14 an hour to work in distribution. Usually, the employment conversation about the decline of bricks-and-mortar retail is centered around job losses. “The department store platform seems to be falling apart,” said Mark Muro at the Brookings Institution. The reason, most observers agree, is that consumers are increasingly likely to make their purchases electronically. As the number of orders processed online and delivered by companies like Amazon, Wal-Mart, and Staples rises, so does their need for workers in their distribution warehouses. In June, the Bureau of Labor Statistics said that the number of warehouse and storage-sector jobs had risen roughly 3.9% year-over-year, to a preliminary count of 948,500. As a result, HR managers at distribution warehouses across the country are under pressure to hire and retain workers. They face a classic supply-and-demand problem that’s complicated by some unique challenges. To start, since their facilities all have similar transportation requirements, they tend to cluster near highways in the same areas. That means they’re competing for labor within the same talent pool. To make matters more complicated, the warehouses’ geographic requirements don’t always line up with the population. Many facilities are built on the fringes of major metro areas, or else in rural or semi-rural small towns. Top distribution locations include Riverside, California; Toledo, Ohio; Jacksonville, Florida; and Cranbury, New Jersey. And the people who take warehouse jobs are often low-skilled, speak little or no English, come from a wide range of cultures, and often have difficulty managing multiple jobs, family responsibilities, and expectations like being able to get to work on time. For many retailers, distribution is a strategic issue that is so sensitive, they won’t even talk about it. A number of warehouse HR professionals SHRM Online spoke to asked not to be identified, and other companies declined to make their HR staff available for fear of “revealing best practices and insights” to their competitors. Nearly all of the warehouse HR practitioners we spoke with pursue similar strategies with the goal of becoming a favored employer. Warehouse work is physically demanding and often entails long hours, but employers try to create the best working environments they can by, for example, keeping facilities spotlessly clean, understanding that warehouse workers often regard things like culture and benefits in ways that are markedly different from their white-collar colleagues, and, most commonly, being present on the warehouse floor and looking for opportunities to have personal interactions with workers. Recruiting and retaining workers is “all about brand and culture,” Courter said. While she said Romark offers competitive pay and benefits, the fact that its warehouses are air-conditioned (many of its customers require it) and that employees remain on the clock during lunch breaks has a big impact on retention. In addition, Romark allows workers to choose shifts of 8, 10, or 12 hours, with the option of working weekends if they prefer. It’s an unusual approach to scheduling, Courter said, but the flexibility helps build the company’s reputation as an attractive place to work. Most warehouse HR professionals say a significant number of their workers come to the company through referrals or general word of mouth. One person brings in an application from a cousin, for example, or members of a community talk up their company because they feel they’re being listened to and treated respectfully. To encourage such outreach, many warehouses offer referral bonuses. Another tactic is to actively seek ambassadors among longer-term employees and ask them to spread the word in their neighborhoods about available job opportunities. One Scranton-area distribution center targets community and religious gatherings at local Hindu temples and encourages its employees to tell others that the employer offers free English as a second language classes to the primarily Hindi-speaking population. Once people are hired, spending time on the warehouse floor is a key to HR’s success, several practitioners agreed. Romark, for example, has HR staffers at every 1 of its 6 facilities, said Courter. “Personal connections are very important. People want to see you on the floor, see that you understand their needs,” she explained. Nearly all the HR practitioners we spoke with stressed the importance of treating warehouse workers as professionals. But they also emphasized that it’s important to use a different approach from the one they take with white-collar workers or skilled tradespeople. An HR business partner at a national retailer’s distribution center agreed. She attends meetings with each department every week. Since most of her workforce speaks Spanish, she asks the strongest English speaker in the group to translate for her. Calli thinks that’s a smart approach. “You should always make use of information leaders, the workers who speak better English, to help you communicate new policies and other information,” he said. But even if you have a good translator, this doesn’t mean you’ve overcome the issues presented by a multicultural workforce. Warehouse jobs are typically filled by employees who come from a range of cultures, for example, native-born Americans, Hispanics, Indians, and people from the Middle East. By thinking proactively, employers can minimize any historical tensions between different groups, practitioners say. Yet while most in HR are keenly aware of the number of cultures represented on the warehouse floor, few talk about that diversity as a problem. In a fast-paced and demanding work environment, tensions and disagreements can arise, she added. “You have to be proactive, hear both sides and bring people to a common understanding.” Such dynamics, she said, are another reason to have an HR presence in every facility. 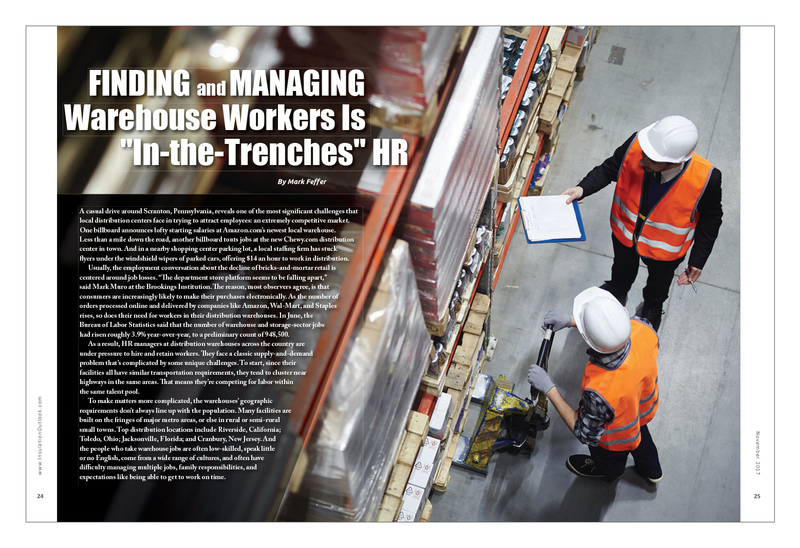 Managing a distribution warehouse’s employees is about as close to “in the trenches” as HR can get. 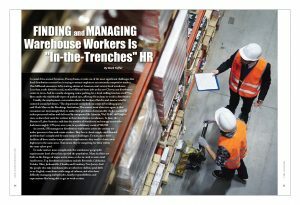 Resolving most challenges—from recruiting difficulties to absenteeism to personal politics on the warehouse floor—in some way depends on HR professionals being visible and known individually by the workforce. The owners of privately held Romark, for example, call their employees “the foundation of our business success” and back up those words with simple actions that go a long way with their warehouse associates: They send birthday and anniversary cards to each worker and hold events that focus on and involve workers’ family members. They endeavor to make sure each worker understands what’s expected of him or her and pay close attention to the condition of their facilities, as well as to safety precautions. For Courter, “it comes down to knowing the person and letting them know someone’s paying attention.” If an employee unexpectedly misses several days of work, she’ll talk to the person to “find out what’s going on and look for a way to deal with it.” In addition, her company actively encourages employees to approach HR in advance if they anticipate a string of absences. When associates know the people who work in HR, they’re more likely to do that, and to appreciate the process. It’s an example of how “knowing the associates is a part of retention,” Courter said. Reprinted from Society for Human Resource Management, August 2, 2017, with permission of the Society for Human Resource Management (SHRM). ©SHRM 2017. All rights reserved.